extended wheelhouse with privacy curtain & rail. co pilot seat with folding leg. Compass Plastmo 90 fitted on teak base. This is a good example of the hardy Fisher 24 Extended wheel house. Obviously well cared for, the engine fired up first time when I boarded her. She has not been used very much since the owner acquired her new. Ideal for fun cruising & sight-seeing, fishing, diving and short overnight stays, she is a flexible boat that will appeal to many types of boaters. This model has the extended wheelhouse and a 200Hp engine for very swift passages. With lots of room available from both inside the wheelhouse and outside in the large cockpit, there is plenty of space for all your crew regardless of the weather. 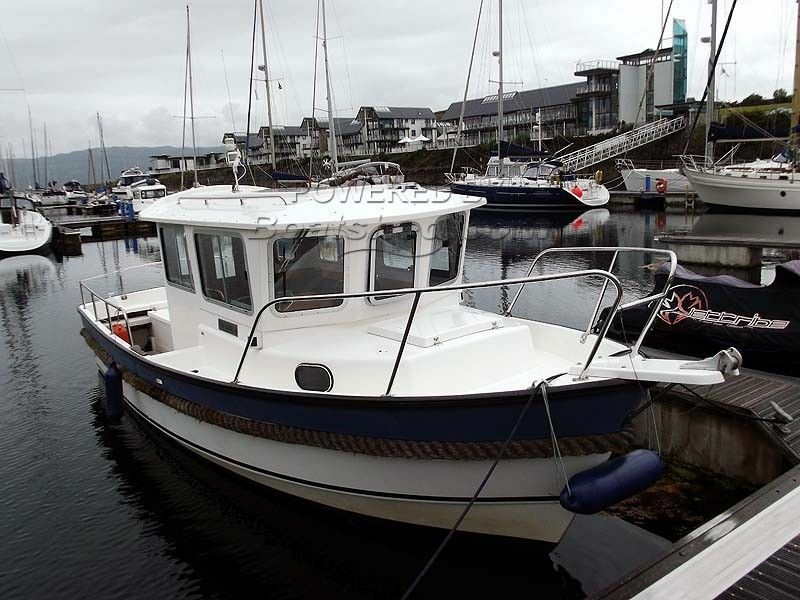 This Hardy Fishing 24 - Extended Wheelhouse has been personally photographed and viewed by Ian Sawkins of Boatshed Scotland. Click here for contact details.